Good news to Arduino fans. Arduino announced 3 new products Leonardo, Due and WiFi shield. The biggest news probably is Arduino Due which will use SAM3U processor from Atmel. Also Arduino 1.0 is on the way. I’m closing of this project as I think that with the current configuration I will not be able to achieve what I want. This project has been frozen for some time but I’ve picked it up again, not much progress has been done mainly because I don’t have the electronic components. Buying them in Ireland is a bit expensive so I mainly use Ebay to get them form UK or Asia. The problem with Ebay is that it takes time for the components to arrive. 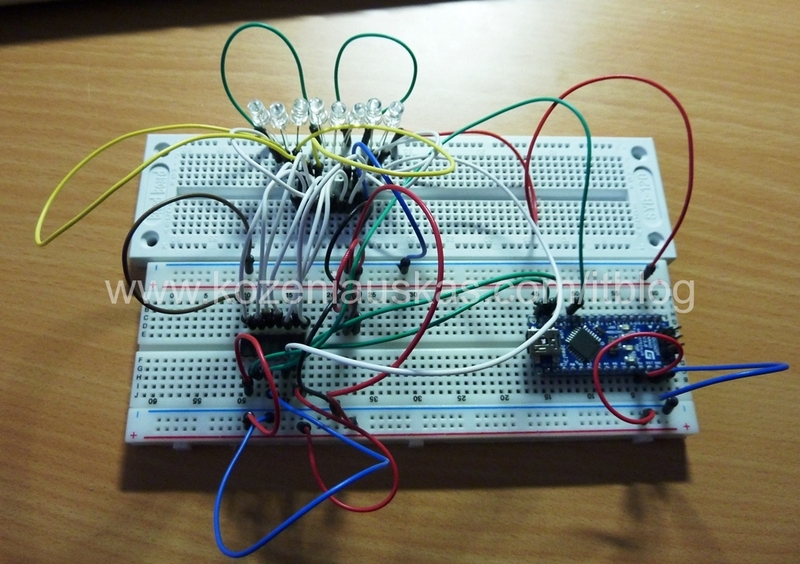 Anyway I’ve been playing around with shift register 74HC595 as I’ve ran out of digital PWM pins on my arduino. By using only 3 digital pins and 74HC595 I can control 8 LEDs but it is also possible to add more 74HC595 and that means more LEDs without using more digital outputs. The problem is that for my application 74HC595 is not suitable as it does not support PWM. It is possible to make LEDs fade using code but I did not like the results that I was getting. The solution would be to replace ULN2803A with 2x ULN2064 quad Darlington arrays as they can handle much higher currents. I’m putting this project on hold until I get the LEDs. Hopefully it won’t be long. Step by step I’m getting closer to setting the lights up. I’ve went to person who will be having these setup, to check the situation with cables and how to proceed further. Everything is looking OK and we did some testing. The only problem we had is that the current setup is using AC 12V voltage source and for arduino I need DC voltage. In order to get DC voltage from AC voltage I will add diode bridge to my project. Here is part 3. No video this time as there is not much to show. I’ve tested ULN2803A with couple 12V LEDs and it seems to work fine. Now I need to move from my ‘lab’ to the site where it will be installed and see what is needed over there and try to implement it in real environment. Hopefully I’ll be able to do that this year. In this part I’ve connected the second IR sensor and Light sensor. As you can see in the video when the light sensor is covered Arduino gives my a sign that it is night time by running Leds from one end and back. At the moment there is a delay until the lights starts switching off if during the delay any of the IR sensors are crossed the delay starts counting from the beginning. While testing I’ve noticed that some Leds instead of dimming just switch off. Reading through Arduino forum I’ve found that apparently Arduino can only to analogWrite() on digital pins 3, 5, 4, 9, 10 and 11. This is what I most liekely will have to live with or maybe get myself Arduino with ATmega. This post will be something different compared to the posts on this blog but it is still ralated to IT. About a year ago I’ve found out about Arduino and really liked what can be done with it and how easy it is to use. So I’ve bought it…. Well needles to say I played around with for day or 2 and forgot about it.